Whether you are in the process of purchasing a new fridge or already have a fridge there are ways to make it more efficient. First you need to figure out which type of refrigerator you have, coil on rear or condenser on bottom. We will add photos to show the difference as soon as possible. In this type of fridge all of the cooling is accomplished by the condenser dumping heat on the rear. 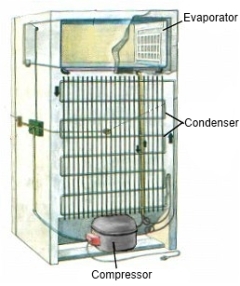 The evaporator removes the heat from the fridge and the compressor sends it to the condenser on the rear. The condenser is always hot while the refrigerator is in operation. One of the biggest issues for these types of fridges is where they are installed. Most homesteaders simply make a closet like structure in their kitchen cupboards and insert the fridge. Now the refrigerator is stuck in a hot box for the rest of its life. The only way the fridge can cool itself is by the condenser being cooled by room air. The hotter the room air, the less cooling can occur. The cooler the room air (the greater the temperature differential) the more cooling will occur. You can save a decent amount of energy just by placing your fridge in an area where there is a lot of air movement. Another option is to create air movement with an efficient fan such as a typical bathroom fan. Simply install the fan in the ceiling or wall (just like in a bathroom) and wire it to operate in parallel with the compressor. When the compressor is on, the fan will remove the hot air which will be replaced by cooler room air. Ideally the heated air would leave the home in the summer to reduce cooling costs and be directed to a cooler room in the winter to decrease heating costs. You would be surprised how much heat is produced every day by a refrigerator. If you already have a 12 or 24 volt battery bank, it might make sense to operate a more efficient DC fan such as a 12″ Snap Fan. The trick is to make your DC fan operate while the compressor is running. This is a lot easier that it sounds. All you need to do is connect a relay to the two AC wires entering your compressor. The relay will turn the fan on and off as the compressor turns on and off. If your fridge is flat on the back and has the compressor, condenser and fan all stuck in the bottom you can also make it run more efficient by using any of the above methods. Alternatively you can make use of the fan already available in your fridge. First Step: Simply install duct work on the “AIR IN” to a cool area of your home to supply cool air to your fridge. This does not have to be fancy. You can use inexpensive ducting like that used for your bathroom fan or clothes dryer. Second Step: Install duct work on the “AIR OUT” to direct the heat outside in the summer and to a room that could use extra heat in the winter. Every time the compressor is started, the fan draws cool air and directs the heated air where we want it. If your kitchen shares a wall with your unheated or cooler garage, consider cutting a hole in the wall for your fridge. When you mount the fridge in this hole, the back of the fridge will always be located in a cooler area. This will make your fridge use less energy and heat your garage. Some refrigerators have a small heater that heats the outside to keep condensation away. If you are unlucky and have this feature it can usually be disabled by turning this switch off. Some units have an energy saver switch to disable this ridiculous feature. Don’t have a second fridge in the basement. It is always more efficient to operate one larger fridge than two smaller units. Always allow items to cool before placing them in the fridge. Inserting hot items will make your fridge work hard for no good reason. Always install your refrigerator in the coolest location possible. Do not install your fridge close to an oven, heating duct or in the sunshine. Try to install on an outside wall as that will be cool in the winter. Monitor the temperature inside your fridge. Aim for a temperature of 35°F to 38°F (2°C and 3°C ) inside the fridge and 0°F (-18°C) in the freezer. By setting your freezer to -9°F you will increase the energy consumption by about 25%. Watch for frost build up monthly and defrost if necessary. It would not be uncommon for an extra 20-40% to be wasted if your freezer compartment has a lot of frost build up. Empty space in your fridge is wasting energy. If you find your fridge is always half empty, get a smaller unit. Keep the condenser of your fridge as clean as possible. Fridges operate by removing heat from the inside and dumping it outside through the condenser. Dust and dirt will act as an insulator and force your unit to work harder. Love these ideas. I’m curious if anyone has actual data on efficiency improvements ducting the back of the fridge. It would be interesting to have those numbers before drilling a duct. Thank you for your question. That is a hard one to answer though. Depending on the location, ambient temperature, and enclosure (closet or cupboards) the fridge is in and how dirty the compressor and condenser are the efficiency gain will vary greatly. Any testing I’ve been involved in showed decrease of 5 to 15% in energy consumption of the fridge with ducting versus without. Hope that helps at least a little.